I never could see the man in the moon, except when the Apollo program was running. And yes, I’m old enough to remember it – but also young enough to have wished that I’d been ten years older to better appreciate it. I always saw the rabbit in the moon. So, I decided to paint it, seeing as I had an aging bucket of gesso and some craft paints that needed to be used or lost. I thought it would be good to get this done while it was still cool enough to paint outside, and I just got finished in time. The sad part is that whether or not anyone is happy with it, it’s now going to be too hot to paint outside in the light, so Salton City is stuck with this one until October. The matted pieces in the bin are getting a little thin on the ground after a run on their sales. Then I was handed a stack of mats. A little smaller than I usually make, but still a nice size. So I had to start work on them…. This is a collage rather than a refractured watercolor – the pieces come from different ‘parents’. “Stolen Moon”. 10×8″ collage on foamcore, matted to 11×14″ frame. $90. A couple days at the lake. Despite the fact that I live close to the largest body of water in California, it’s not terribly enjoyable during the ‘hot’ season, and Doug and I like to go up to Lake Cuyamaca – up in the mountains, 5000 above the Salton Sea, about an hour and half away, it’s a whole nother climate. We rented our favorite little cabin for three nights and packed up bedding, fishing gear and the bare basics of a kitchen. On the first evening we went out for a stroll and saw a lot** of wildlife. I had left all connections to work behind, except I took some writing paper, thinking I would put a few poems together. This came out of the evening walk across one of the dams that forms the lake. You will see once you get into it the tune that it’s based around. The last line though requires a little more explanation. We had just crossed the dam and saw a squirrel in the path. We stopped. The squirrel stopped. Then, as we continued, instead of scooting up a tree, it walked down the path towards the dam, just like people walk past each other on a city sidewalk. And a squirrel walked right past us on the path. Of course, having left all connections to work behind, that included the camera and on the last evening I was unable to photograph the view across the still lake just after moonrise, which confirmed that there is an even quieter cabin on the other side. I did this from memory. On the easel – “Cabin” – original oil on canvas 24×36″ $1080. “Comma Moon”. 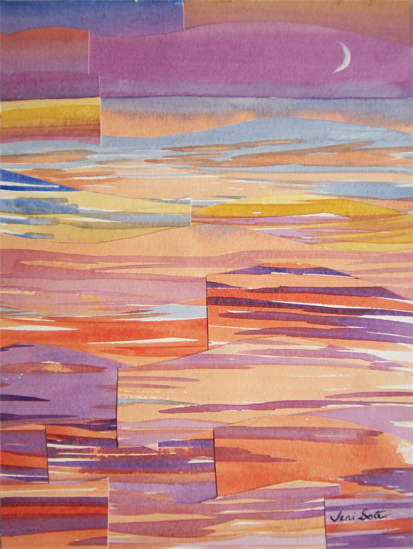 Watercolor collage on panel, 12×9″. $135. It’s always interesting to get feedback from viewers of my artwork. Sometimes they will see faces or other items ‘hidden’ in the clouds – that I never intended to put there. 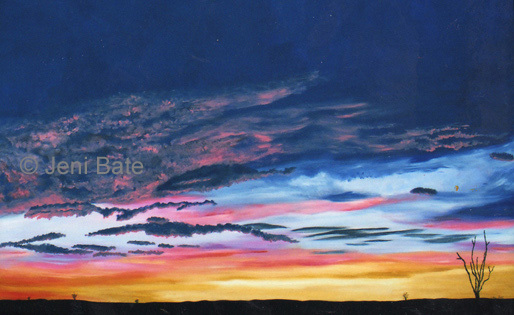 I remember in particular a painting of a winter solstice dawn in Salton City, the time of year that the sun comes up out of the water, it seems. In the painting the sun was about halfway above the horizon, and the long bright reflection reached towards the viewer, getting narrower as it came closer. It was one that I particularly liked. One day a little girl (about three) came in the booth holding her father’s hand and pointed to this painting, which was on the lower half of the wall, just at three-year old eye level. “Oh Daddy, look at the ice-cream!” Of course after that I could never un-see the ice-cream. The painting did sell not too long after, and I hope the new owner never sees the ice-cream, it did detract from the view. 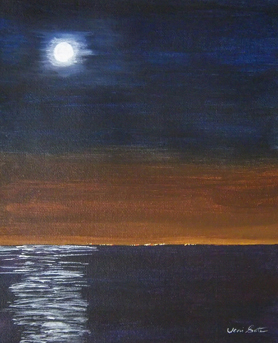 Recently I had one follower comment that she liked my paintings that included moons, and is currently considering a purchase, but I seem to have pretty much sold out of moons. Indeed it was true – there were only two. Well, red rag to a bull, now there are three. 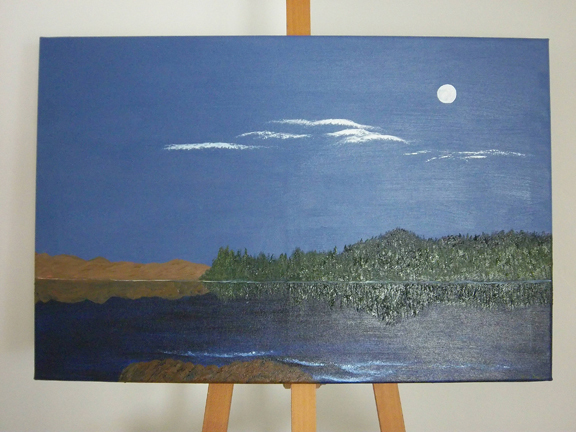 “Moon on Water” 10×8″ acrylic on loose canvas. On eBay. One of the delightful offshoots from the Big Bear storm, is that I met with Michael Faitl, owner of Desert Sun Gallery in Crestline. I will be taking work up to his gallery on Thursday, to start a small show to run through some time in September – we haven’t firmed up that detail yet. I will be taking oils and acrylics to this gallery, and have been busy making some additional small paintings for this show. Michael is a photographer – I have only seen his work online – he got rained out of Big Bear faster than I did! Also – had a little time this afternoon to put some of the newer collages up on the website – check them out! And some new items on eBay.